Crain’s New York Business has released its infamous Book of Lists, highlighting top organizations within specific sectors in the New York area. 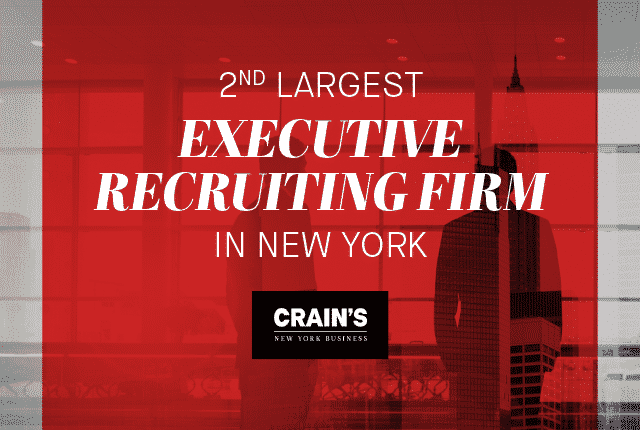 Following the conclusion of 2018, we have been named the second largest executive recruiting firm in New York. We are honored to receive this recognition and want to extend our thanks to all of those who have made this possible. On April 21st, Solomon Page Group was among the firms honored at “The Best Companies to Work for in New York” 2015 Award Dinner in Albany. The program is a partnership between NYS-SHRM, Best Companies Group and The Business Council of New York. This annual event is sponsored by Capital District Physicians’ Health Plan and Jackson Lewis, LLP. In all, a total of 60 companies in two size categories were selected from the large field of statewide entries and invited to the dinner to learn their ranking. We are proud to receive this honor for the fourth consecutive year and we view this award as a shared accomplishment. It is not only testimony to our efforts to create an entrepreneurial, collaborative and supportive professional environment and workplace but also an incentive to find new ways to make our firm a better place to work. We recognize the contributions and value of all of our employees and appreciate their choice to be a member of Solomon Page Group. After nearly 25 years in the staffing business, we continue to seek their commitment by demonstrating our own and building relationships we are proud to share. Solomon Page Group is again on Crain’s New York Business’ list of New York’s 150 Largest Privately Held Companies (Nov. 17-23, 2014 issue)! Now in our 24th year of providing professional staffing solutions, we continue with our commitment to provide quality, consistency and results under one coherent brand standard of excellence. Our broad range of specialty offerings and services is the cornerstone of the success we enjoy and seek to share with our clients, candidates and employees. On May 6th, Solomon Page Group was among the firms honored at “The Best Companies to Work for in New York” 2014 Award Dinner in Albany. The program is a partnership between NYS-SHRM, Best Companies Group and The Business Council of New York. This annual event is sponsored by Capital District Physicians’ Health Plan and Jackson Lewis, LLP. In all, a total of 60 companies in two size categories were selected from the large field of statewide entries and invited to the dinner to learn their ranking. We are proud to receive this honor for the third consecutive year and we view this award as a shared accomplishment. It is not only testimony to our efforts to create an entrepreneurial, collaborative and supportive professional environment and workplace but also an incentive to find new ways to make our firm a better place to work. We recognize the contributions and value of all of our employees and appreciate their choice to be a member of Solomon Page Group. After 23 years in the staffing business, we continue to seek their commitment by demonstrating our own and building relationships we are proud to share. Solomon Page Group is again on Crain’s New York Business’ list of New York’s 150 Largest Privately Held Companies (Nov 17-23, 2014 issue)! Now in our 24th year of providing professional staffing solutions, we continue with our commitment to provide quality, consistency and results under one coherent brand standard of excellence. Our broad range of specialty offerings and services is the cornerstone of the success we enjoy and seek to share with our clients, candidates and employees. SOLOMON PAGE GROUP LLC has again made this year’s list of Staffing Industry Analysts’ Largest US Staffing Firms! Each of the companies on this year’s list generated revenue in excess of $100 million in 2012. In total, the $70.1 billion in US staffing revenue comprised an impressive 54.1% of the total market. Rankings were made solely upon revenue generated with SPG in 84th position. Staffing Industry Analysts is known for its independent and objective insights, the company’s proprietary research, award-winning content, data, support tools, publications, and executive conferences provide a competitive edge to decision-makers who supply and buy temporary staffing.